Soil sampling and testing is an essential part of making good fertiliser decisions. Fertilisers are a large cost to farming pastures in high rainfall areas. This page is specific to sampling high rainfall pastures (more than 600mm average annual rainfall) in the south-west of Western Australia. By following these guidelines, you will have reliable information for making those expensive fertiliser decisions. budget and plan for farm nutrition. have a paddock record system to track paddock tests over time. sample at least every 3 years, or more frequently if soils are sandy or there is high nutrient removal in products. be at least 30m apart. You can buy prepared soil sampling kits from a number of manufacturers. These kits are available from most rural suppliers. If you use a soil sampling kit supplied by a fertiliser company, read the instructions supplied carefully because they may have specific sampling instructions. One sample of 30–40 individual cores should be enough for paddocks smaller than about 10 hectares (ha) with reasonably uniform soil. Collect 1 sample (of 30–40 individual cores) for every 10ha of larger paddocks, even if the soil type appears relatively uniform. Collect a sample from each management area of different soil types within a paddock, and have them analysed separately. Soil testing can be a waste of time and money if samples collected are not representative of the area. The top 10cm of soil over a hectare contains about 1300 tonnes of soil, so a 100 gram subsample from a 10ha paddock represents only 1 part in 130 million! Short cuts in sampling, such as taking only 1 or 2 cores, or only a handful or spadeful of soil, will give misleading and costly results. 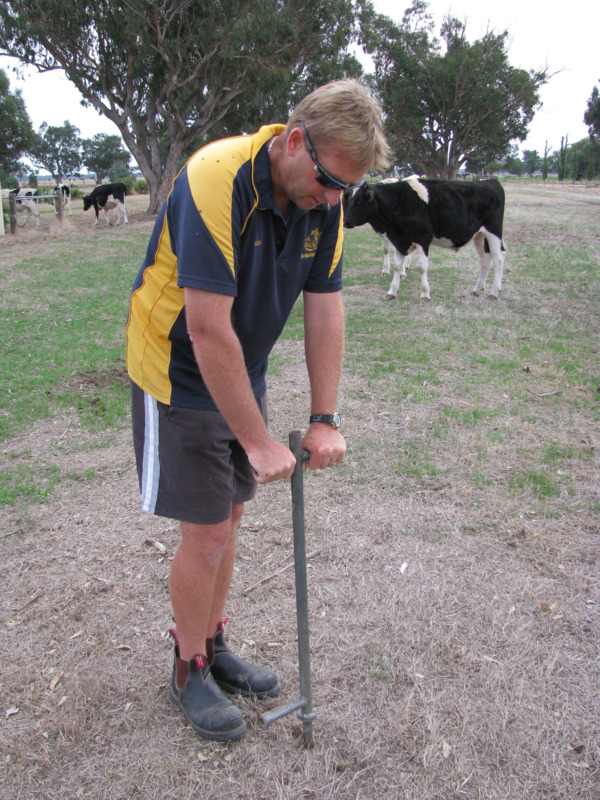 The standard depth for soil sampling pastures in Western Australia is 10cm. Soil testing standards and critical nutrient levels in WA have been based on this sampling depth. In high rainfall pastures, the concentration of nutrients in the soil decreases rapidly with depth. Sampling to less than 10cm will give a higher reading, and sampling to deeper than 10cm will give a lower reading. Basing decisions on shallow or deep sampling will result in lost production or wasted money. 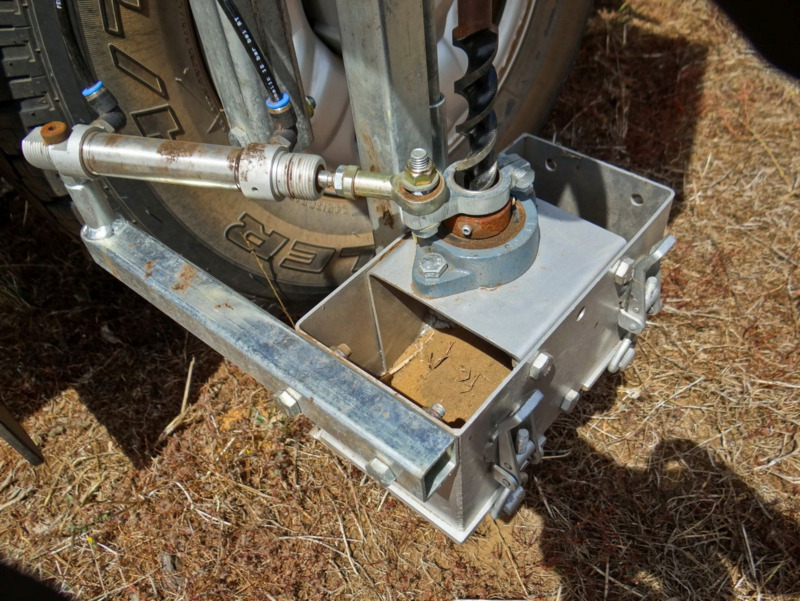 Sampling deeper into the soil profile for other soil constraints — such as subsoil acidity — requires a different sampling technique and program. See Diagnosing soil acidity for more information. Traditionally, samples have been collected by walking across the paddock with a sampling tube or ‘pogo stick’ which is pushed into the ground at the selected spot and the core tipped into a bucket or plastic bag by tilting the sampler upside down. If the soil is loose, tilt the sampler towards horizontal while it is still in the ground to avoid losing soil from the bottom of the tube. Do not kick the surface before sampling because results will be artificially low. Keep a consistent depth; a heavy person will sample deeper than a lighter person. Check the tube regularly for blockages. 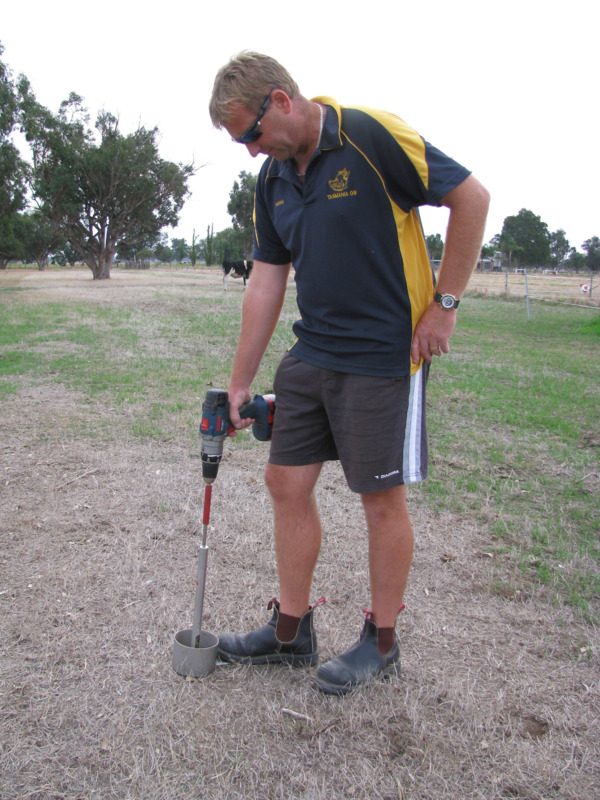 Hard soils can be sampled more easily using a drill-mounted soil sampler. Take care to keep the sampling depth to 10cm. Keep the sampler upright and still. Remove the sample immediately after the hole is fully drilled; this avoids taking too much sample from the walls of the hole and from near the top. Mechanised sampling equipment makes soil sampling easier and quicker. Contractors are more likely to use this equipment because of the higher cost of labour. The equipment must consistently sample to 10cm. If you do change to using a contractor, be aware that your sample results may change slightly from previous sampling. Do not use a shovel or trowel. If the individual sample cores are collected into a bucket, make sure that the bucket is clean and completely emptied between samples. There is no one ‘correct’ sampling pattern but, once you select a sampling pattern, stick to it. The same pattern should be used when collecting samples for plant tissue testing. Fixed transect across a paddock: start in one corner of the paddock and walk in a straight line to the diagonally opposite corner, collecting 30–40 sample cores on the way. Ear tags or wooden stakes can be fixed to fences to mark a transect and it can be marked on your paddock map so that you sample along the same transect each year. Zig-zag across a paddock: start in one corner of a paddock and zig-zag across it to the diagonally opposite corner, collecting 30–40 sample cores on the way. It is difficult to sample along precisely the same zig-zag transect each year. Fixed points in a paddock: select reference points in the paddock or record GPS coordinates so you can locate them in future years and collect a number of samples within a set distance of that point, for example 5–10m. You need to have enough points to give you a total of 30–40 cores for the paddock. Sampling contractors should be able to supply GPS points on a map showing where the cores were taken. sampling within 3 months of fertilising; if this is unavoidable, increase the number of cores to at least 60. Non-irrigated pastures should be sampled from late-December through to March. If you are sampling by hand, soils which set hard when dry should be sampled before they dry completely. Sampling at the same time each year will reduce some of the variation inherent in soil testing. Irrigated pastures should be sampled in early spring, generally when the soil has dried enough to make sampling possible, and at least 4 weeks after the last application of phosphorus or potassium fertiliser. Store your soil and tissue testing records in a form that allows you or your adviser to retrieve them easily. Common options are apps for mobile devices and computer spreadsheets or databases. The better ones of these will link to a paddock mapping program which will download the laboratory results without having to enter them manually. Once you have accumulated records over a few years, it will be more obvious when an unexpected figure turns up and retesting may be indicated. Prepare a map showing all the areas to be sampled and assign each a permanent number to use each time the paddock is sampled. Mark features on the map that could indicate areas that should be sampled separately, such as slopes, watercourses, previous paddock boundaries, areas of reduced yield. For each paddock, maintain a record of the crops grown each year, the results of previous soil tests and the amount of fertiliser applied. Note the location of samples and fertiliser pattern in your records. Send your soil samples for testing to an accredited laboratory – accredited by the Australasian Soil and Plant Analysis Council (ASPAC), and using the analytical methods appropriate for WA soils. Soil testing is used to help estimate major fertiliser requirements and tissue testing can be used to monitor and provide feedback to the fertiliser program. nutrient levels not suited to soil testing, such as micronutrients. For more information, refer to the 'See also' links to the right of this page, or the contacts below.